A charter school in the Mojave Desert charts the heavens. Connecting with the Cosmos: A 34-meter-diameter radio telescope is the centerpiece of the Lewis Center curriculum. In the middle of the Mojave Desert, about 100 miles northeast of Los Angeles, students in the Mission Control room are monitoring a rocket in oblong orbit around Earth and the Moon and dutifully reporting their observations to the National Aeronautics and Space Administration. 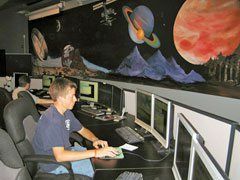 The fully operational space center is just one of the many student-run programs at the Lewis Center for Educational Research's Academy for Academic Excellence, a K-12 charter school in Apple Valley. In this series of smart, low-slung buildings nestled against a rocky outcropping, there are endangered fish to check on, sick tortoises to tend, and native plants to cultivate in the greenhouse. Surrounded by surprisingly lush grounds of native plants and synthetic grass along the Mojave River, the Lewis Center for Educational Research, serving some 1,300 students at the academy, is an oasis in more ways than one: The modern buildings blend seamlessly into the landscape; the brick in the walls reflects the speckled pattern of nearby rocks. Large steel-framed windows bring in natural light and provide vistas onto the desert floor and the stunning blue sky. And inside, a commitment to real-world learning is taken to soaring heights -- literally, into space -- with spectacular results. Rick Piercy, president and CEO of the Lewis Center school, strides confidently across the blooming campus (which is on a unique freshwater marsh on the Mojave River) wearing a black button-down shirt embroidered with the colorful logo of NASA's LCROSS (the Lunar Crater Observation and Sensing Satellite) program. This observatory-turned-charter school located in a parched corner of California is essentially his baby. The astronomy enthusiast and former park ranger organized the center around his own passion for science and his conviction that education works best in the context of constructive collaboration. "Aesthetically, it's a very pleasing place to be," says Piercy, "but we want kids to understand that learning goes on forever. This way of educating kids -- getting them involved in these hands-on experiments, getting them involved with real scientists and engineers and mathematicians, working with NASA -- really improves their education, because it becomes relevant." In 1985, Piercy was a kindergarten teacher at nearby Mojave Mesa Elementary School, where he replaced his afternoon remedial-reading classes with the Young Astronauts Program, a brainchild of the Reagan administration. "I had 30 kids every day who knew the principal's office better than he did," he remembers. "These kids were just wild. But when we started doing all this hands-on science, their behavior was great, because they were tactile, kinesthetic learners." Connecting with the Cosmos: Demonstrating student pride. That winter, Halley's Comet swung through our corner of the solar system on its 76-year orbit, and Piercy planned an evening star party for the Young Astronauts and their families, thinking a handful would show. On that frigid winter night, more than 200 eager skywatchers stayed up until 2 a.m., peering through the school district's ancient telescope. Piercy decided that if astronomy could so enthrall students after just a few hours of lessons each week, an observatory on campus would inspire even more passion for learning. The superintendent told Piercy that if he raised all the money, on his own time, he could have one. In five years -- with events like fun runs named the Race for Space, along with private and in-kind donations, and the support of lawmakers such as U.S. representative Jerry Lewis, who made important contacts (and for whom the school would eventually be named) -- Piercy and his team raised $1.2 million in cash to build what was then called the Apple Valley Science and Technology Center. The district was so impressed with Piercy that an assistant superintendent suggested he open a charter school -- a new concept at the time. In spring 1997, the district board of education granted a charter, and Piercy and four other staff, bolstered by a $750,000 line of credit from a local bank, opened the school doors. Piercy then wrote proposals for two state bills authored by a local state assembly member, which bestowed several state grants that enabled them to purchase 150 acres along the Mojave River and to expand the program in 1998 into the Lewis Center. In addition to the 1,300 students enrolled in the K-12 program, it has 3,000 more on a waiting list. Even though the students are accepted at random, they have the highest test scores in San Bernardino County. But that wasn't quite enough for Piercy, who was tipped off about a radio telescope being decommissioned at Goldstone, a part of NASA's deep-space network located about 70 miles away, outside of Barstow. The telescope, 34 meters in diameter and weighing nearly a million pounds, had been used for various lunar missions, and Piercy wondered whether the students could find a way to use it. He contacted Congressman Jerry Lewis, who helped facilitate a meeting with Daniel Goldin, then administrator of NASA. For the first time in the history of the space program, a $12 million radio telescope was turned over to a school. 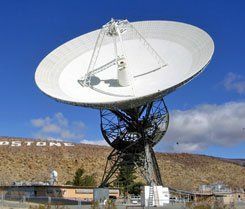 It was renamed the GAVRT, the Goldstone Apple Valley Radio Telescope. "That telescope would have just rotted in the desert," says Goldin, whose career spanned three presidents and 62 shuttle launches. "I saw an incredible opportunity. We had a group of very enthusiastic people at the Jet Propulsion Laboratory that would build the technical bridge to the students. There was no reason the students couldn't direct the pointing of the telescope and evaluate the data." Any school can participate in the GAVRT program or even take part in NASA's new Lunar Reconnaissance Orbiter (LRO) program, but Piercy notes that principals don't need a NASA connection to bring science into their schools. "All schools are in places with scientists -- just go to the phone company, the gas company, the water company," he says. Principals can also tap local industry for community partnerships. At Lewis, a local concrete company donated the greenhouse where students cultivate native plants so they can replant areas disturbed by mining. The fish ponds actually started as a student's science project, and they are now recipients of a grant from the U.S. Fish & Wildlife Service. The tortoise habitat was built in cooperation with the local Home Depot. And none of the school's programs would be possible if it wasn't for the support of dozens of local volunteer organizations, from the California Turtle and Tortoise Club to the High Desert Astronomical Society. 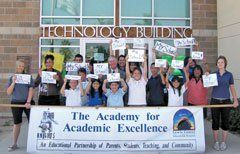 "I think every school needs to find its niche," says Piercy, who launched another charter school, the Norton Space & Aeronautics Academy, in nearby San Bernardino in August 2008. The bottom line, he explains, is that once you've founded it, any school can do what the Lewis Center has done for its students. The GAVRT project has since taken control of a more modern telescope and half of another. Schools in 37 states and 14 countries take part in the project, exposing 48,000 students, as well as their teachers, to a special curriculum around NASA's programs and real-life missions. From the Mission Control computer lab, students have participated in the Cassini mission, designed to collect information on Saturn and Jupiter, and have mapped potential landing spots for Opportunity, the JPL-deployed rover that has been collecting data on Mars since 2004. Spaceship Stars: A student in the school's Mission Control center monitors a mission for NASA. This year, NASA brought the GAVRT onboard to help with its launch of the Lunar Crater Observation and Sensing Satellite, in which a Centaur rocket will crash into the polar region of the moon to search for water. "We've tracked things for other spacecraft," says Piercy, "but this is the first time a school has served as the mission-control center for the tracking." This concept of participatory exploration not only provides actual, real-time data for teachers to demonstrate but also gives kids a sense of ownership. "One of the things you realize is that by making the students part of the mission, it becomes their mission," says Brian Day, education and public-outreach lead at NASA's Ames Research Center, who brought Lewis Center students down to a launch in Florida last June. NASA is working on another mission involving students: a detailed photographic atlas captured by the LRO, which reached the moon on June 23. "Students will be able to receive the images and help categorize the landforms," says Day. "They'll help build the database." Mission Control isn't the only part of the school built to enable experience-based learning, says architect Gaylaird Christopher, who designed the Mojave River campus and specializes in educational design at Architecture for Education, his Pasadena, California, firm. "There's such passion from teachers and students, and we've really talked about how the building can reinforce their learning," he says. Completed in 2000, the new Lewis Center campus is a research-based, sustainable design that acknowledges and preserves the fragile ecosystem. Even the structure is part of learning at Lewis: Students give tours about the area's natural history and conduct environmental research there. 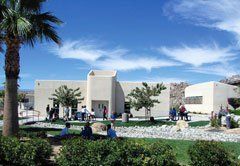 Greening the Desert: The campus along the Mojave River provides a learning landscape by using drought-tolerant plants and synthetic grass. The centerpiece of the complex is the main technology building, a 32,000-square-foot structure funded by a $4.5 million state grant that came after Piercy was introduced to then California governor Gray Davis. The two-story brick-and-stucco building blends seamlessly into the landscape. The curved stucco walls reference the dwellings of its Native American predecessors (whose inhabitants left artifacts and petroglyphs nearby). The flexible spaces are meant to be easily convertible between uses, and it feels like every possible inch of wall space is transformed into a teaching moment, whether it's a student mural or an exhibition on local water issues. A focus on technology is evident beyond Mission Control, a two-story lab set up much like NASA's legendary rooms, with a curved wall, projection screens, videoconferencing, and a glassed-in viewing platform for spectators. Regular classrooms feature technology walls, where whiteboard panels slide away to reveal a complete audiovisual kit of projectors, sound equipment, and computers. Interactive whiteboards are used in parts of the school for real-time collaboration with schools across the country. A massive production studio has blue screen and green screen capabilities and several Mac-equipped editing suites. Students produce everything from reports on their NASA-based work to funky music videos. Outside, there's a simulated planet -- Rox-1, a sandy, red-tinted land formation with a charcoal-colored cave, perfect for driving the Lewis Center's rovers around or for extracting mineral samples. Besides being a scientific wonderland for students, the Lewis Center has brought technology and worldwide attention to a rural area that wouldn't have been exposed to it otherwise. Its observatory events, lectures, and mission demonstrations engage and educate local residents. Teachers from other schools train here in the GAVRT program as well as in other high tech skills. And it's helping the next generation to be more competitive, according to Deborah Gaidzik, the teacher who runs the space-science program at Lewis. "When you're moving part of an 850,000-pound telescope with a mouse and talking to a NASA scientist, that's pretty different from reading it out of a book," she says. "When these kids are applying to colleges or for scholarships, that will make a difference between them and another student." Chase Bains, a recent graduate who's headed to Oregon State University to major in mechanical engineering after being accepted to nine colleges, believes listing the GAVRT projects on his résumé -- as well as a recommendation from Congressman Jerry Lewis -- made the difference. "They were pretty amazed that we were able to do what we did as young as we are," he says. "I got a lot of comments from admissions counselors who were really impressed." 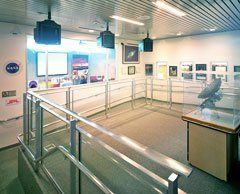 Wall of Fame: The Mission Control viewing area is lined with space-exploration memorabilia, including items from NASA scientists and astronauts. Piercy's philosophy of "letting kids do what adults thought only they were qualified for" applies to the school's expansion, an ambitious move that will require a massive capital campaign. Piercy looked to the students to drive the design through workshops held in collaboration with architect Gaylaird Christopher. In a series of sketches prepared from their ideas, it's evident the school is training more than scientists -- these are big thinkers who understand the concepts of learning. The students envisioned a climbing wall where footholds are marked with math equations that students must solve before they ascend. A hallway will teach time with gigantic interactive pendulums and hourglasses. The lunch area will be a pavilion where students sit in the belly of a model blue whale. Alicia Scarberry recently graduated from the Lewis Center's academy after transferring to the school during her junior year. She was a GAVRT intern who traveled to Florida to watch the LCROSS launch, and now says she's committed to a science career. "It was the greatest thing I've ever done," she gushes as she leads a tour around the grounds, pointing out the national-park-quality kiosks she designed and built for the fish habitat, where students are trying to educate residents about the rare local tui chub. "Before I came to this school, I never even thought I could be a scientist. Now I know I can be part of NASA." Alissa Walker is a Los Angeles freelancer whose work has appeared in Fast Company, I.D., Print, and Dwell.